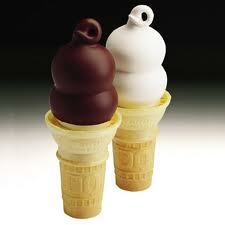 My favorite is vanilla soft serve with the crunch coat/peanut brittle coating. I will eat chocolate when it is the only thing available or when it is “that time” of the month. I love crunchy chocolate on top of vanilla.. oohh. Chocolate candy, heath bars, m&ms, reese’s pnut butter cups with chocolate on top, wonderful hot fudge sundae with of course vanilla ice cream. I will eat little dark chocolate candies all day long. I would like to think I am not as boring or plain as vanilla but I don’t think I am as exciting as chocolate. If you go chocolate, do you ever go back? So, what do you think? Am I chocolate or vanilla?